Hi everyone, welcome to english-learning.net. I hope you are well today. 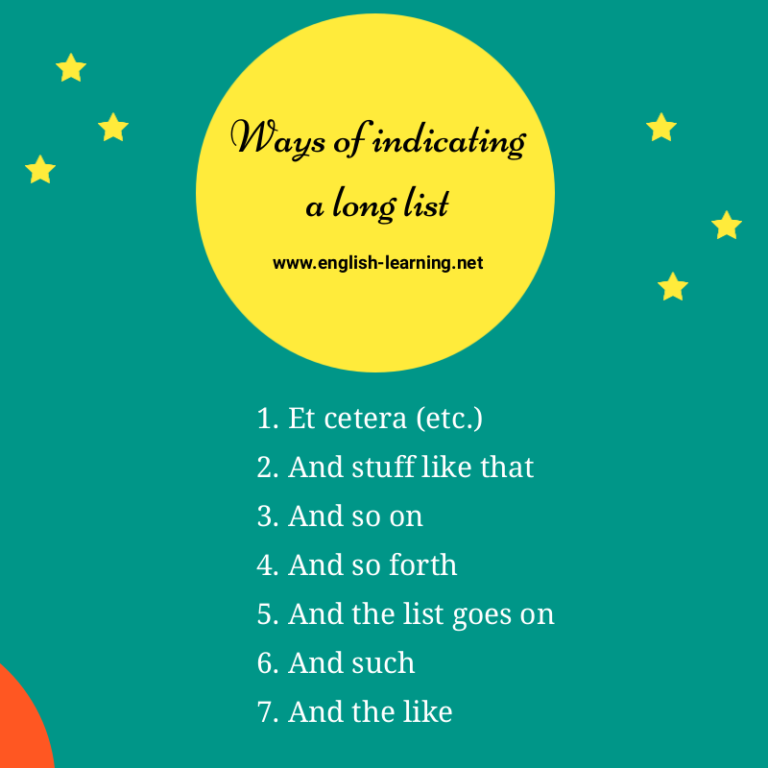 In this lesson, we’re going to learn a variety of ways to include other things in a list. In our center, I can borrow books, listen to music, talk to native speakers, et cetera. There are so many animals in the zoo, like lions, crocodiles, monkeys, snakes, et cetera. You could buy a lot of things on Amazon, cell phone, computer, washing machine, camera, and stuff like that. Our hotel offers free breakfast with bread, fruit salads, bacon, omelette and so on. Global warming could cause extreme natural disasters like flood, drought, earthquake, tsunami and so forth. There are so many beautiful cities in Asia you should visit: Tokyo, Bangkok, Beijing and the list goes on. Mary is really talented, her writing is excellent. She could write great essays, short stories, magazine articles and such. We can easily earn money from social networks, Facebook, Twitter, Instagram and the like. Great, you have finished the lesson today, I hope you find the lesson useful and don’t forget to listen more on english-learning.net. Bye bye.